The last decent Ajay Devgn film I saw released in 2010 — Once Upon A Time In Mumbai. Since then audiences have been subject to Aakrosh, Golmaal 3, Dil Toh Baccha Hai, Singham, Rascals, Tezz, Bol Bachchan, Son Of Sardaar, Himmatwala and Satyagraha — most of which have been taxing to watch. Ajay is talented. Why he subjects us to this trash is beyond me, but I guess box office returns and economics have their place too and sometimes money speaks more than passion for craft. Anyway, his next big ticket release is the sequel to Singham. The first one smashed box office records, and in fact is one of Ajay's biggest hits ever and with Rohit Shetty at the helm of affairs again, its sequel is expected to go more or less the same way. The film has Kareena Kapoor as an added attraction, but probably reduced to a glorified extra — just take a look at the trailer — she doesn't have a SINGLE dialogue in it — I seriously hope they're saving her best for the film itself but it looks unlikely. The trailer does look mighty entertaining with goons being beaten black and blue, corrupt politicians citing inane lines, exploding cars (it's a Rohit Shetty film after all), and a larger than life Devgn bursting with testosterone and taking centre stage. The film will undoubtedly do well with it's Dabangg-esque quality but please can we have both Ajay and Kareena in something a bit more substantial in the near future? It's not really asking much is it? 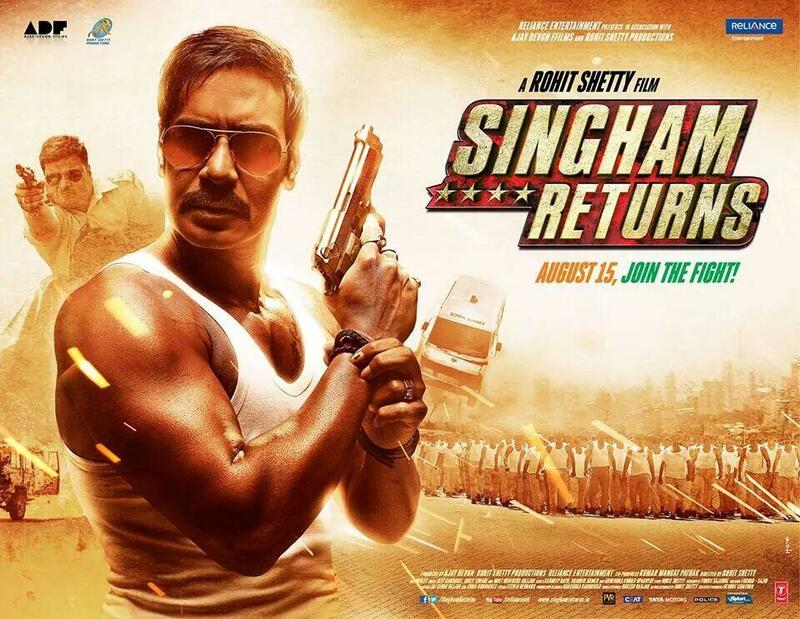 Are you looking forward to Singham Returns? Bollywood couple Hrithik Roshan and wife Sussanne have decided to split and go their separate ways. Ranveer Singh and Priyanka Chopra have been signed on to play siblings in Zoya Akhtar's as yet untitled film. The real life couple will come together in a period film produced by Ajay. More details here. Prakash Jha seems to have given in to commercial constraints and added an item number to his political thriller Satyagraha. Devgn who plays a social activist in his next film says he doesn't see himself getting into politics anytime soon. Actor has asked director Rohit Shetty to speed up work on their next film to help him erase the memory of his latest dud, Himmatwala. Actor gets flaky after director's Himmatwala crashes at the box office. Apparently the senior actor was so impressed with the film's first look he called up Ranbir Kapoor to congratulate him. The actor gets candid and says he only wants to do family oriented films.